Underwater “scooters,” or diver propulsion vehicles, are submersibles that provide divers with greater range and the ability to move large items when exploring the deep. As with most things called “scooters,” they bear little resemblance to the (motor) scooters we ride and enjoy. 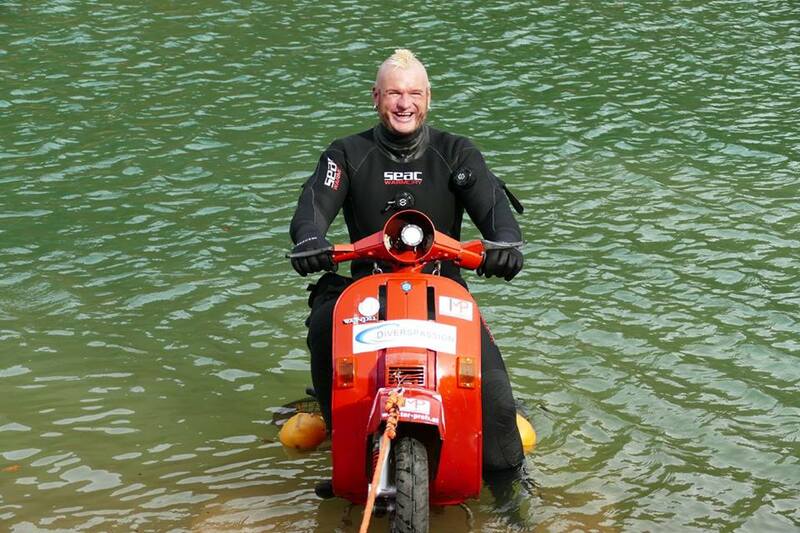 At least, they did until this Saturday, when Austrian stuntman Günther Schachermayr rode a customized, submersible Vespa for 300m at a depth of five meters below the surface of his homeland’s Klauser Lake. The underwater project, or “mission,” as Schachermayr calls his exploits, reportedly cost €180,000 (approx. $197,826 USD), and several Vespas. Two scooters were scrapped after unsuccessful underwater tests. Special care was taken due to concerns about possible water contamination. Local authorities weren’t going to tolerate two-stroke exhaust in their lake. Schachermayr emerges from the not-so-briny not-so-deep. Though no technical details have been released, the vehicle appears to be based on a Vespa PK (the company’s first automatic transmission scooter). The model has been the basis for some electric motor conversions, as is probably the case with the Schachermayr version. Three hundred meters at 15-feet underwater may be enough to set a record for “Underwater Vespa Ride” (we could find no previous record), but the high price and low range isn’t going to inspire many with dreams of deep-sea scootering. However, more than setting records, Schachermayr’s missions seem focused on doing what no rider has done — or even considered — before, such as riding down the world’s longest zipline, doing a continuous 14.7 km wheelie, or the world’s highest Vespa ride up a steel cable in the troposphere. All of these stunts required modified Vespas, an unconventional mind, dedication to scooters, and courage. We can certainly find inspiration in that.